The one with the most fabric in the end wins. Nooooooo!!!!!! I am determined not to have piles of fabric leftover when I leave for the big sewing room in the sky. That goes for notions too. I was digging in the studio and unearthed SIX sets of bamboo purse handles. I’m sure it was some sort of score from a clearance rack. So I dug into the fabric stash and found some groovy hand-me-downs from Mom. The one in the photo here was a chair upholstery project. We had a groovy house. 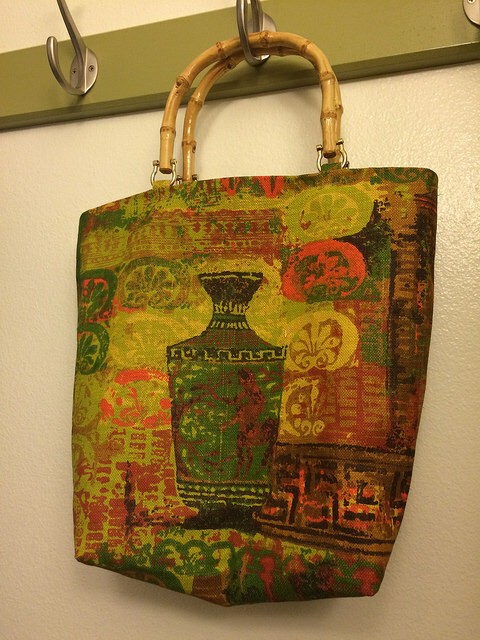 I used my favorite tote bag as my template, created my pattern and got down to business. Click here to see them all, plus notes to make pattern.